After Polly's scary escapade a couple weeks ago, many of you have inquired how she's doing. I'm pleased to report -- she's fine! ...and Matilda and her yearling heifer Amy get the larger stall. Both our Jerseys are fairly low on the pecking order in the herd, so in inclement weather they're likely to get booted out from under the barn awning and have to suffer through rain or snow without shelter. It was a few solid hours of pitchfork work. I dumped the debris on the compost pile, something the chickens appreciated deeply. At last the pens were clean, and I spread them with fresh straw. Now daily maintenance will be much easier -- muck out the previous night's soiled material, spread fresh straw, fill their water buckets, and they're set. In the last couple of weeks, we've toggled between bouts of torrential rain and bouts near-zero-degree (Fahrenheit) temps. 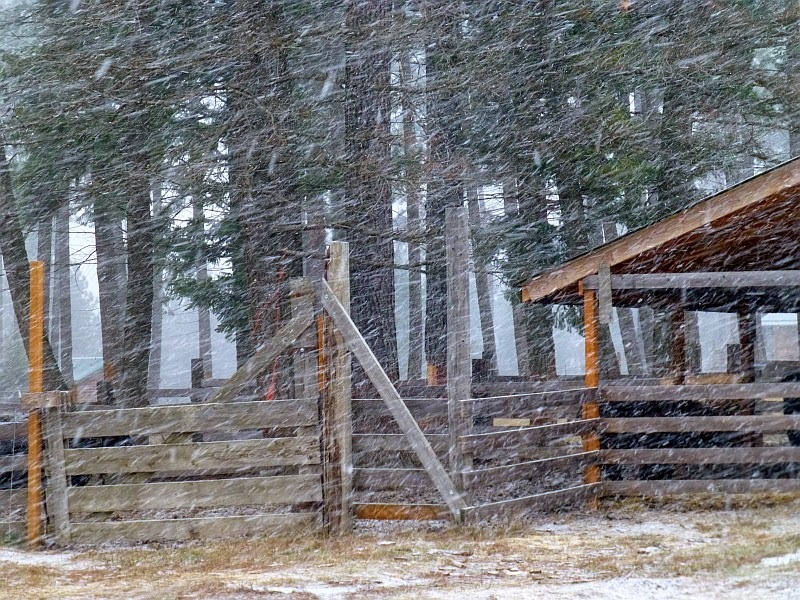 We've had a few snow flurries come in, the first of the year. Here we're actually following our neighbor (in the first vehicle with the hazard lights) who drives the county snowplow, among other things. We've had the occasional frozen hose when we fail to drain it properly. We're grateful for our stock tank heaters, which keep the water tanks free of ice for the livestock. In such weather, it makes me feel better to know Polly and Matilda and their calves are under shelter. It's c-c-cold out here to you west and we've still got lots of snow on the ground, soon to be followed by more if the forecasts are correct. Brrrrrr. I hope they're wrong. We have a Jersey Heifer. She is due to calve late December. I feed her one-half bale of good quality hay, with one medium-sized pumpkin and around a pint of grain once a day. I know your cows are being milked and have calves on them, but ours sure looks over weight. Do you think we are feeding her right? I just don't want her to have trouble when calving time comes. Thanks. We have Jerseys as well. Ours look more plump than the ones shown in their pictures and have never had trouble calving. Enjoy that milk and that new Jersey baby. There is nothing more cute and pretty than a Jersey calf. Got to love a Jet Sled when comes to chores!